Anti-Graffitti coating that is an extremely tough, hard wearing, protective coating that will protect against weather, chemical attack, abrasion and graffitti. POLAGARD AG (Anti-Graffiti) is a remarkable aliphatic urethane that cures to form an extremely tough, hard-wearing, protective coating. It will vigorously protect the substrate against graffiti and vandalism, weather, chemical attack and abrasion. POLAGARD AG meets or exceeds all Department of Transportation coating system requirements for soundwalls, bridges and Jersey barriers. Can be used over concrete, stucco, mineral composites, bricks/masonry, fibreglass composites, metals, EIFS, insulation, porous stone, non-porous stone, wood, wood composites, structural steel, industrial equipment and other surfaces. Graffiti can be removed repeatedly without damaging or sacrificing POLAGARD AG or the substrate. Protects your investment by increasing the effective service life of the substrate. Waterproofs, and is salt & chemical resistant. Facilitates easy, rapid removal of graffiti, dirt, soot, and other contaminants. Remains tough at low temperatures and will not soften at high temperatures. Easy to apply by brush, roller or airless spray. Protects metals with corrosion-inhibiting components. Resists age-induced embrittlement and retains long-life flexibility. Sets quickly and develops strength rapidly. Can be used over concrete, stucco, mineral composites, bricks/masonry, fibreglass composites, most metals, EIFS (need to apply Polaprime 25), porous stone, non-porous stone, wood, wood composites, structural steel, industrial equipment and other surfaces. The substrate must be clean, dry, and free of loose particles, oils, or any substance that would interfere with adhesion. 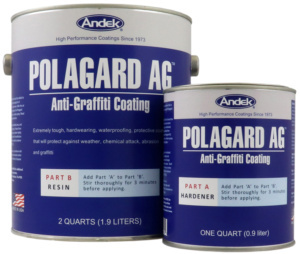 All repairs should be made prior to application of POLAGARD AG, and all repair materials must have completed setting or curing; otherwise, poor adhesion or discoloration may occur. E.I.F.S. and other materials that may be weakened by solvent exposure should be sealed with CLEARCOAT AQ. Concrete and all cementitious materials must be adequately cured (normally about 28 days). The substrate must be clean, dry, and free of loose particles, oils, or any substance that would interfere with adhesion. 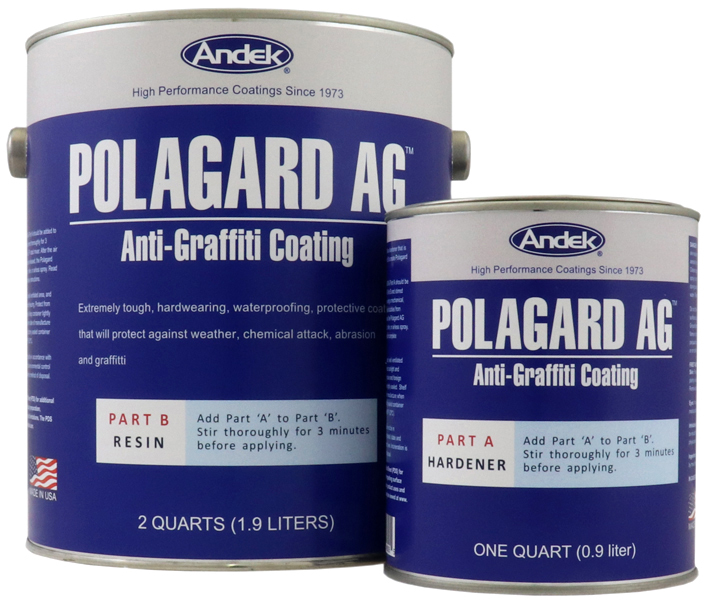 All repairs should be made prior to the application of POLAGARD AG, and all repair materials must have completed setting or curing; otherwise, poor adhesion or discoloration may occur. Metals should be primed with POLAPRIME 21. Wood and mineral composites should be primed with POLAPRIME 2. Other surfaces may need priming; refer to POLAPRIME data sheets for further information. Painted surfaces should be tested for compatibility. The best results may be obtained by complete removal of the paint without causing damage to the substrate. Some painted surfaces may require treatment with POLAPRIME 7 to prevent bleed-through or staining. After preparation is complete, a coat of WEARCOAT 44 should be applied at a rate of 200 square feet per gallon. POLAGARD AG Part A should be added to POLAGARD AG Part B and stirred thoroughly for 3 minutes using a mechanical, E.P. rated mixer. After the air bubbles from mixing have been released, the Polagard AG may be applied by brush, roller, or airless spray. Application to porous or highly textured surfaces may require two or three coats to obtain complete protection. Application over Wearcoat 44 is normally one single coat unless the surface is highly textured; then, two coats may be necessary. A minimum of 6 hours cure time is necessary prior to re-coating and a maximum of 72 hours shall be allowed for re-coating; otherwise, sanding, sweep blasting, or other surface abrasion may be necessary to obtain adequate intercoat adhesion. Approximately 6 hours at 70°F (21°C) and 50% RH. Approximately 72 hours at 70°F (21°C) and 50% RH. Clean tools and equipment with xylene or toluene solvent. Do not apply to frozen surfaces. Do not apply unless the temperature can be maintained above 40˚F for 8 hours. Surfaces must remain at least 5˚F above dewpoint during application and curing process. Application must be protected from precipitation for at least 4 hours. Do not contaminate product with moisture. To remove graffiti, use environmentally approved cleaner to repair any damage to the coating system, call our Technical Department for assistance. Store in a dry area and protect from direct sunlight and freezing. Keep container tightly sealed. Shelf life is 2 years from date of manufacture when stored in a factory sealed container between 40ºF (5ºC) and 90ºF (32ºC).